For the November SOAPBOX John Holland-Kaye Chief Executive Officer of Heathrow puts the case for the Airports Commision to give his airport priority in building the next runway for London. 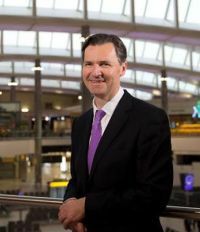 John was appointed CEO of Heathrow Airport with effect from 1 July 2014. He joined the company as Commercial Director in May 2009. From November 2012, John was Development Director responsible for delivering the £2.3bn Terminal 2, The Queen’s Terminal, which officially opened on 4 June 2014. The redistribution of airlines from the old Terminal 1 has been very smooth. He was previously Divisional CEO with Taylor Wimpey Plc, having held a number of positions including Operations Director of Taylor Woodrow Developments and Commercial Director of Taylor Woodrow Inc. Prior to that, John was Managing Director, National Sales Division, of Bass Brewers, and has also worked as a strategy consultant with LEK Consulting for a number of high-profile businesses. This month the Government’s Airports Commission is holding a nation-wide public consultation, creating an opportunity for UK business travellers to have their say on the future of the UK’s airport capacity. To outsiders, it appears through the Government’s Airports Commission process that Gatwick is a competitor to Heathrow. Nothing could be further from the truth. Heathrow, the UK's hub airport, gets British business to their global markets as well as making it easier for investors and tourists to come to the UK. It is a strategic national asset. Expand Heathrow and we can provide regular direct flights to and from 40 new long haul destinations – keeping Britain at the heart of a changing global economy. By not expanding Heathrow we are handing growth to our European competitors. The cost to the UK will be £14bn each year in lost trade and a lost opportunity for skilled jobs. But the opportunity is equally clear: expand Heathrow and it is Britain that can win the "Race for Growth". The Chief Executive of Japan’s All Nippon Airways (ANA) last month announced his airline would look at expanding routes through hubs in Germany rather than the UK if congestion at Heathrow is not resolved. He is not alone – I heard the same message from airlines on a recent trip to China and Korea. The consequence is that to attract investment and reach those growth markets, we will increasingly have to go through France or Germany. Heathrow is not only our global gateway, it is also our biggest port – over a quarter of British exports go through Heathrow, carried on the same planes that carry our exporters. Pharmaceuticals, high tech components, high quality fresh food all get to global markets by air. Gatwick primarily serves low-cost carriers flying to Europe – airlines that don't do cargo. The government has set a target of doubling exports – how can we hope to do that if we don't expand Heathrow? It is Heathrow, that is now at capacity and having to turn away new routes. Some say the hub model is dead – the future lies with "hub busting" 787 "Dreamliner" aircraft which can make long distance point to point flights viable – where is the evidence? Almost all 787s so far have been ordered by network carriers who operate from a hub – in fact, the launch airline for the 787 was none other than ANA – the airline that wants more flights to Heathrow. 'Hubs' are the most efficient way of connecting people and things – whether it be the Royal Mail, great rail junctions, shipping ports, mobile or digital networks. Even Facebook and Google operate on the basis of network economics. We need to be more honest about where the real competition is. The French, Germans and Dutch have all invested heavily in their hub airports. Istanbul and Dubai are building new ones. They all want the growth that could be ours. The real questions are this: What role does Britain want in a changing and competitive world? Do we have the ambition to remain at the heart of the global economy, or are we prepared to be on a branchline to growth? This is what business and business travellers need to ask themselves during the Commission’s public consultation. If we are ambitious as a nation, we need to get back in the race and address the bottleneck in our economy – by expanding Heathrow, our hub airport.